I tend to defend the horses, most are pretty honest. Is it possible that when your horse tenses, you actually cue the problem behavior? Your body language says, “OMG, we’re gonna die! !”and he hears you loud and clear. A lot of times, horses are totally justified, and the rider who intends to blame her horse actually ends up inadvertently bragging about her own ignorance. Once while scribing at a dressage show, a well-known trainer came in on a very green (imported) horse, who was understandably nervous about the judge’s stand. The trainer made jokes to the judge about the horse being stupid. She used harsh words and the judge laughed. Hearing that interaction has colored how I see this trainer. It’s probably a good thing I’m not a judge, I might disqualify half the rides. I hear the bad stories from new clients, but the tone is different, almost an apology. “He doesn’t load in the trailer.” “He pulls on the reins.” “He hates to canter.” Asking for help is a great time to tell the bad story for the last time. Sometimes in a lesson, the dreaded problem, so horrible and unforgivable, goes away and the rider doesn’t notice, she’s too busy complaining. The truth is that most horses let go of an unwanted behavior about as quick as their riders do. Words are so powerful, and recalling a bad moment brings that experience into the present moment all over again. What if having a winning story to tell is as easy as using other words? Step one is to tell a better story. Words are so powerful and especially when combined with an intuitive 1200 pound animal who reflects them right back at you. “Good boy” praise when your horse is still thinking about a task can build confidence and try. If you are too stingy to say “good boy”, consider taking up gardening. At first it takes a bit of discipline, so much of our ordinary language is grounded in problems and lack. Pick a positive set of words, let them be the rule. Keep taking deep breaths, and give your horse time to think. New story, new ending. If you are afraid that positive reinforcement will make you look weak, go ahead, praise your horse all the way to the Winner’s Circle. It is the lowest form of horsemanship to blame or ridicule your horse. When you talk trash about your horse, you betray your partnership. Always. If you do have a bad ride, it’s just good manners for the rider to take responsibility. And of course, if you have a great ride, your horse gets all the credit. The people who matter know the truth and so does your horse. Great information and perfectly timed. Wonderfully insightful comments, as always, Anna. Horses are our mirror in every way, so it becomes obvious which one in this partnership has to change first. Part of our positive attitude plus positive words is visualizing our horse going willingly into that trailer, moving forward with animation, crossing that scary bridge, etc. Animals think in pictures, not words, so when we visualize our horses (dogs, children, etc.) succeeding, we automatically assist them in achieving whatever the goal is for that day. Amen! Beautifully said, Anna. Sometimes we need the good, clear, strong reminder that is in this post! I’ve caught myself a few times starting down the wrong road, before thinking, “what’s wrong with me? I’m the game changer in this equation. I can take responsibility or I can let the horse suffer…which is it going to be, Jane?” A very wise person once said to me when I was whining about a human relationship, “Would you rather be right? Or would you rather be close? It’s in your hands.” Perfectly translates to horses. Thanks, Jane. I agree, being ‘right’ isn’t all it’s cracked up to be. I don’t think you can go wrong with this positive approach to training.. One of the biggest things that kept me from thinking positive about my horse was being stuck in a negative pattern of comparing her to other horses. Wondering why she wasn’t like other “well behaved” horses in the barn, or past horses that I had had. Once I got past wishing she was something else and started meeting her where she was at, I started to take more joy and pride in any little step of progress and guess what, we progressed a lot faster. My nightmare horse became mt dream horse. But it was MY mindset that had to change, teehee. Great comment, and I appreciate what it means to meet her where she’s at… humans have a hard time with that sometimes. So glad to hear about your perfect horse. I couldn’t agree more. I used to manage a lesson facility and the students would tell me how they “got thrown” or “got bucked off” by one of my good friends, the lesson horses. These stalwart good citizens put up with much and never threw or bucked anyone off, they didn’t even know how. 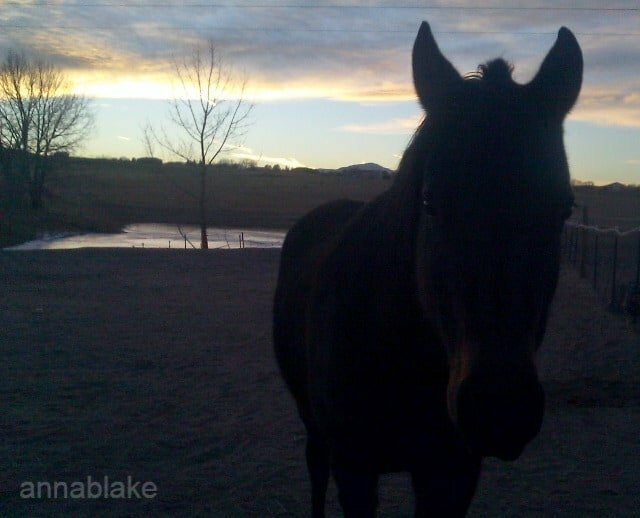 Accepting responsibility for our own actions is one of the lessons our horses teach us. Maligning the speechless and innocent just isn’t acceptable. I would take a deep breath and we would have a discussion on the definitions of falling off, losing balance vs being thrown or bucked off. Life and riding are balancing acts. Both take practice, and one helps the other. Betty, this is the best comment ever, I couldn’t agree with YOU more!